Listed here is a fraction of the organizations, worldwide, involved in the protection, conservation, rescue and rehabilitation of sea turtles and their habitats. Seaturtle.org maintains a comprehensive list of 60 countries and territories. Turtle species and annual behaviors differ, so check your local area to learn more. SWOT: The State of the World’s Sea Turtles The Oceanic Society, the IUCN Marine Turtle Specialist Group (MTSG), Duke University’s OBIS-SEAMAP, and an international team of local organizations, scientists, and conservationists working to speed up conservation of sea turtles and their habitats. They collect and share and distribute data. This is the only, fully global organization of this kind. SWOT’s annual reports are packed with information. Home of the historic Kemp’s ridley “Headstart” program. 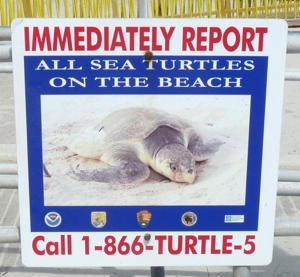 Annual nesting info is collected and maintained by biologist, Dr. Donna Shaver, Chief of the Division of Sea Turtle Science and Recovery at Padre Island National Seashore, part of the US National Park Service. Dr. Shaver was very helpful in answering my questions during my book’s early drafts. The most extensive, global clearinghouse website for turtle information is Seaturtle.org. They have lots of links to other organizations, conferences, and photos. Check out its Marine Turtle newsletter. A number of its generous members gave me permission to use photos for this website. Many thanks! 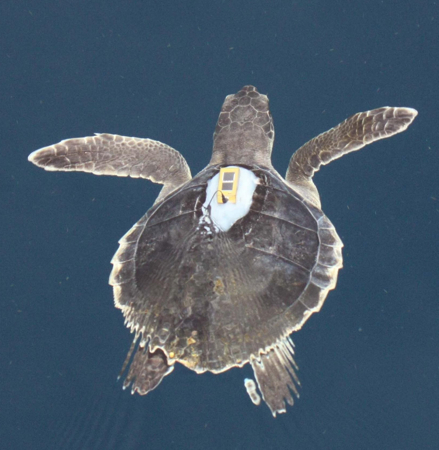 Conservation efforts depend on tagging to identify turtles and recover data for short and long-term scientific study. Living tags: A small piece of plastron (bottom) shell is removed and inserted into one of the darker scutes of the carapace (top shell). Each scute is assigned a different year so the researchers can easily tell when the turtle was tagged. Metal flipper tags: These are etched with coding to identify the turtle. PIT tags: Passive Integrated Transponder. A tiny (grain of rice size) glass pellet containing an inert wire, capacitor, and chip that is injected into the muscle of the turtle. 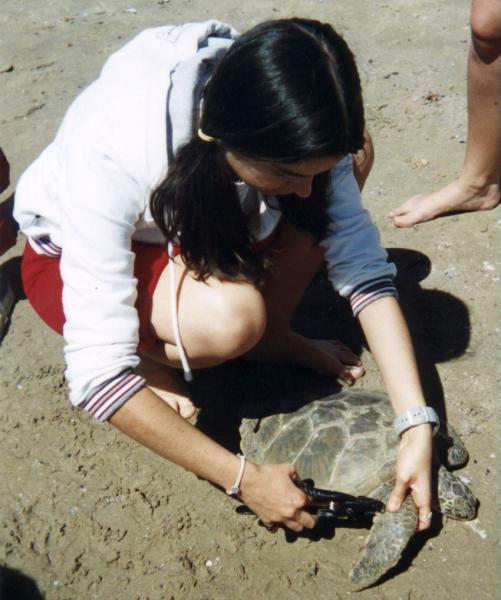 A scanner device is used to pick up the unique alphanumeric code in the transponder that is then compared with records to find the specific turtle’s history. SATELLITE TRACKING One of the most extensive site for watching satellite tagged turtles is Seaturtle.org. You can watch the daily travels of satellite-tagged sea turtles in seas all over the world. 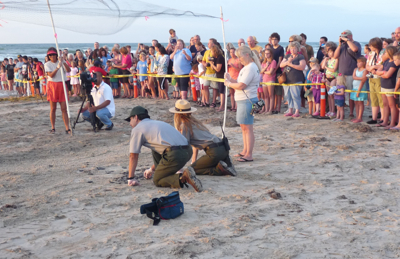 One of my favorite programs, the symbolic Adopt-a-Turtle helps support the tracking program. The site’s Groups page links to over 200 sea turtle conservation and research organizations. Many also offer similar Adopt-a-Turtle opportunities. Look for one that matches your interests or area. Kemp’s ridley juvenile with satellite tag. Most rehab facilities have conservation and education programs. Look for one near you, or check online for one that’s involved with the turtles you care about. Adopt-a-Turtle programs are widespread. Here are a few organizations I’ve supported and/or worked with during my project. Sea Turtle Restoration Project Part of Turtle Island Restoration Network whose wildlife advocacy projects cover multiple species. PINS collaborates with STRP, which posts turtle nest reports during nesting season. Check STRP’s site beginning in April each year for nesting stats. Center for Biological Diversity Works to save a variety of species. One of the key organizations that filed suit to stop BP from burning sea turtles during spill clean-up. IBR (International Bird Rescue) Big player in the BP oil spill clean-up and other rescue and rehab on birds. Many thanks to Matthew Godfrey of the North Carolina Wildlife Resources Commission for photo permissions. A number of international sea turtle researchers allowed me to use their photos. (apologies, I don’t know how to add accents in this program). Alejandro Fallabrino: Karumbe Project (Uruguay): One project teaches locals and tourists about turtles in Uruguay. Want an eco-vacation with turtles? Spend two weeks or more helping at Karumbe. There are many turtle rehab facilities in the U.S. and abroad all need our support. Below are those who helped me shape Elizabeth’s experience with Sunny, Maddy, and the shark-bit loggerhead Price brought into the Center. Seaturtle, Inc. South Padre Island, TX: “Rehabilitation, Education, Conservation” This diversified sea turtle facility is a great place to visit in person, or via its website. President, Shane Wilson and Director, Jeff George helped me understand many realities of sea turtle conservation. Supported entirely by public donations, they are one of the few organizations approved to relocate and protect sea turtle eggs in a hatch and release program. Many of its releases are open to the public. They also have an adopt-a-turtle program, local outreach programs to schools and great lesson plans, and annual internship programs. Mote Marine Lab, Sarasota Florida: Like Elizabeth, I’m sort of a chicken when it comes to the bloody stuff. But I love science and one of the most exciting things on the Mote website is its Turtle Hospital. I spent a bunch of time there going through all species of turtles, all sorts of ailments and procedures the Mote vets used trying to fix them. Charles A. Manire, DVM, now of Loggerhead Marinelife Center, graciously helped straighten me out on the specifics of the turtles’ treatments that appear in the book. New England Aquarium, Boston MA teams each winter with MA Audubon Society volunteers and staff to rescue and rehabilitate cold-stunned turtles that wash ashore and would die without help. If you have sea turtle education sites you’d like me to consider listing, please send me a note through the Contact Me page. SEE Turtles.org hosts a wonderful education website geared to grades 6-12. Co-founded by internationally known, Dr. Wallace “J.” Nichols, its website has a growing series of lesson plans (more videos coming). SEE Turtles.org and its Billion Baby Turtles collaborated to make the video “Sea Turtle Migration,” which introduces us to this critical behavior in the lives of many sea turtles. Sea Turtle Restoration Project: Another terrific set of educational materials. Teacher handbook and lesson plans, videos, posters, activity and coloring pages, and more. Sea Turtle Conservancy has State of the World sea turtle map. Get lots of data on your favorite species lay their eggs. Use the Groups page at Seaturtle.org to find efforts near you where you can participate or make a contribution.